That went for £500 + commission. A bargain even with the confusing discription and label. I looked closer at the label and it was 4.0 u p which was under proof. I'm assuming 60 old proof then. Whiskyauction results for February and March. I've not been paying my usual attention to this tread. Writer's Tears Cask strength 2011 got €83. I've been neglecting this page recently. If any others follow auctions please feel free to post results. Jameson 12 Asian edition £82.50. These are rare and that's a fair price. Jameson 15 PPS & JOHNNIE WALKER 12 YEAR OLD EXTRA SPECIAL DECANTER, the estimate was £130-180 but the Hammer price was only £90. does this place do a lot of whiskey auctions? I think they have one every 6-8 weeks. The online-whisky and Scottishwhiskyauction sites are better for Irish but the prices are usually bigger too. yep. I gave that one a go...... but backed off way before the hammer. thats a lot of money for a NAS whiskey. True Birdman, but I was down in a certain pub in Dingle and unbelievably the measure price put the bottle price in that very range (notwithstanding the currency differential). I really like this release though. I think that was a serious over inflated price. I remember seeing a Midleton distillery reserve bottle(dumpy bottle) getting £240 at an auction last year. I have seen lots of bottles sell at auction then pop up on Whisk(e)y shop sites later for well over the hammer. I can understand why the price in pubs are so high too John. It's so rare that each bottle opened ups the price. The current price of 1980's Redbreast is €400/500 in shops. It can still be found in certain bars for sale at standard prices. If they knew how rare it was it would be multiples more. The Mano A Lámh is way better whiskey too. A 70 Redbreast made €404 at the last Whiskyauction.com. There's on in the Whiskyauctioneer.com this week and I wonder will it fair as well. A Teeling 21 1st batch made €555, amazing. There's another this month. Jameson 15 got €322. A RVR got €252 which is good value for the quality I think. I've a tonne of results I've yet to post but will get there when I get a computer. The phone is too awkward for these post. it appears that the one without the numbering is more popular? Perhaps its more legit that we originally thought? Well that turned out to be a cracker of an auction. Whiskyauctioneer.com seems to be the new home for mental prices. Remember last months Mano A Lámh got £250. There were 3 Redbreasts MoL this time. They got £82/88&85. A Green Spot previous bottling got £135. That Jameson 15 Millennium mentioned fail to sell at £300. The other made £310. 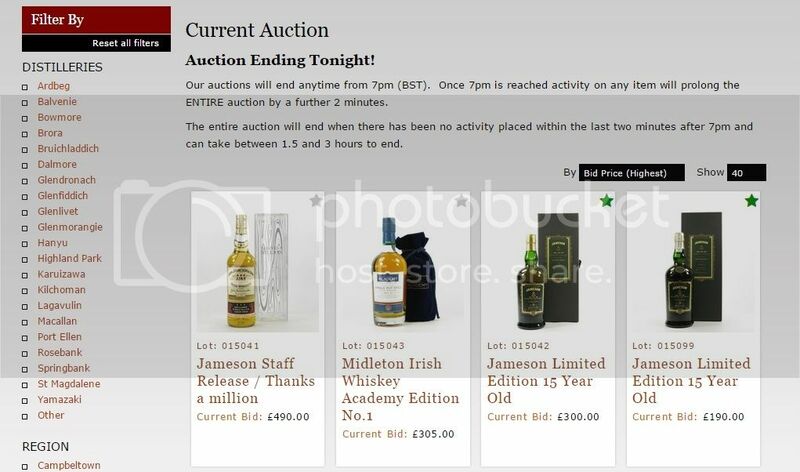 A Jameson 'Thanks a Million' failed to sell for £490. A Bushmills 1975 Millennium bottle got £141. Great value. I saved the best to last. A 80's Redbreast got £140. That was a disappointing result I think as these are getting rarer to find. I've only seen a handful in auctions over the years. A 70's Redbreast made £245. Thats about €375 with commission. That's a fair price considering one sold at last months whiskyauctions for €404. Now comes the mental. A 60's Redbreast 12 year old 5 fl oz(142ml) got £400. That's that €612 with commission. . To put it in perspective that's £112(€153) per Irish measure. Another Redbreast 12 year old 70's one made £280. Then a Redbreast 10 year old 5fl oz made £260. Last edited by Good Whiskey Hunting on Mon Dec 07, 2015 12:54 am, edited 2 times in total. Reason: Updated information and hyperlink not reflected in quote below. Good Whiskey Hunting wrote: Well that turned out to be a cracker of an auction. [url=whiskyauctioneer.com]Whiskyauctioneer.com[/url] seems to be the new home for mental prices. That Jameson Birdman mentioned fail to sell at £300. The other made £310. I made out rather well on this auction. I picked up the Jameson 15, one Mano A Lamh, the bushmills 1975 and the Knappogue Castle 1995. All the prices were lower than I was expecting. The previous Italian release Jameson 15 pulled £500. is this a sign of prices going down, or just an anomaly? I say those prices are close to normal. The other ones were crazy. I know the 5 fl Oz are rare but why pay so much more than a full sized bottle. Well done on your purchase by the way. No anomaly, this is very usual for a first (or one of few firsts) to go on sale and they will make good money after that they just fall back down to earth. People need to be very carefully with high prices until they are solid. This may happen again in 6 mths time but again you need to look at the whole picture for a real value. Man o Lamh may yet be a very valuable bottle but you have to remember that this limited edition of 2000 took a very long time to sell out. This to me proves there is still a very limited market for Irish Whiskey but there is always a few willing to pay to get what they want and once that group is satiated the price falls dramatically. I was just taking a look there at the auction website and it looks like the Jameson 'Thanks a Million' bottle sold, and that the winning bid was £490 - but birdman says above that it 'failed to sell at £490'? If that is the case then in my view the reserve was too high - I would have thought that almost £500 was a great price for that bottle? Even the CWS is selling them for 'only' €600! If the seller was the original owner well £1 would have been a great. It's money for nothing after all. We guessed the reserve was £500. If it's not met this time it will be in the next auction. One of the Jamesons had a reserve too. It reached £300 but didn't sell either. McTears had a Glen Dimplex Midleton 25 year old with a Decanter last Wednesday. It got £850 in told. That would amount to nearly €1500 when exchange rate, commission & costs are factored in. It surprised me. I expected it to get £400/500. Here are some results from Just-Whisky.co.uk auctions over the last couple of months. I only recently started following this one. They had some great bargains early one but things have heated up lately. Here's a link to those results. I'm going to highlight the Midletons. I enjoyed drinking the 2009, I probably should have bought another at the time. The 2009 is the one which was released in reduced Numbers. Not sure it equates to the big results though ?!?!?! ?